The Next Chapters: A lot can happen in five weeks. I often worry about the sustainability of my efforts while I am here. I find myself wondering, will 10 weeks be enough time to leave a lasting impact? Will Volset have the means to continue in the future? Will the children live happier, healthier, and longer lives because they learned from my peer-education program? Maybe, hopefully, but I don’t know. Leaving a lasting impression on this village is not about “leaving my legacy.” I don’t need credit or recognition for what I am doing here. However, I do need peace of mind. I don’t think I can physically, mentally, or emotionally leave this place without knowing that I have aided in the sustainability of Volset. My supervisor and Director of Volset, Festus, is one of the most passionate, hard working, and caring men I have ever met. The same day I arrived in Uganda, a woman from America donated money to Volset but did not specify its purpose. Festus asked me to help him write an email asking her where she would like the money to go. I jokingly suggested that we tell her about his broken car. He quickly and sternly replied, “NO! All donations go to the children! I will have money to fix my car when the children are taken care of!” That was the moment Festus earned a lifetime of my respect, Volset earned my trust, and my heart became permanently invested in this organization. Today’s blog is not going to be about me, or my five weeks’ worth of Ugandan experiences. Instead, I will share with you stories that hold much more meaning than my own. I want to tell you about Joseph, Joyce, and Molly; children of Volset. Joseph is a beautiful little boy whose age is estimated to be between 5 and 7. When he sees me, his face lights up and he freezes wherever he is and does this adorable sheepish smile. He is very small and yet his stomach is very big (I believe this is common among malnourished children). Joseph has been at Volset’s primary school, Future Diplomats Education Centre for as long as I have been in Uganda. A volunteer named David discovered him during a community outreach visit in my village. David was at the home of an HIV positive woman who was acting as caregiver for Joseph-despite the fact that she already had a houseful of hungry children to feed. She explained to David that she took Joseph in recently from the health center and he is HIV positive. He was found a few weeks earlier by community members, half-starved in the home with his dead parents and dead brother. Yes, their dead bodies were lying in the house while this poor, sick, and no doubt confused little boy was left all alone. If you are choosing to visualize this, please keep in mind that a typical Ugandan home consists of a 10x12 ft open space within the confines of a mud or wooden structure. Joseph was very ill and David’s big heart reached out to this young boy and brought him to be a student at Future Diplomats under a full sponsorship. Joseph now lives at the school and receives HIV medication, hot meals, sleeps in his own bed, and most importantly, he is loved by many. Future Diplomats Education Centre is as much a home to Joseph as it is a school. Sadly, many other children are just like Joseph, but have yet to meet their David. This leaves them orphaned and alone. Molly and Joyce are nearly identical sisters, born a year apart in the district of Mukono. They are two of 14 children. Sadly, their father died when Joyce was 11/2 and Molly was 21/2. Their mother was left to support her children on her own. While in primary school, the girls met Festus, the man who would one day change their lives forever. He recognized that their mother would not be able to afford their education much longer, and he refused to accept that. Festus took it upon himself to locate a sponsor from Canada to support their education. Tragically, the girls’ mother passed away during their last year of primary school, leaving them orphaned at ages 12 and 13. The girls were able to live at their school dormitory until completing secondary school. At that point, Festus took them in and provided them with meals and a place to call home. Today, Joyce is 19 and Molly is 20. Both girls volunteer as teachers at Future Diplomats Education Centre and are able to stay in both the schools’ housing for teachers and the Volset volunteer house. With all due thanks to their sponsor, Roger, the girls will begin University in August. Joyce will major in Social Services, and Molly will major in Business Administration. Both have grown into beautiful, wise, and caring young women. This is with many thanks to the guidance and love from Festus and the countless other volunteers of Volset. Volset and the Future Diplomats Education Centre change the meaning of the term, “orphan.” Yes, in all technicalities the term still means, “Without a mother or father.” However, it does not have to mean, “Without love, shelter, food, education, and security.” Do many of the children here have tragic pasts like Joseph, Joyce, and Molly? Yes. Will some of those children continue to live through hardships? Maybe. The difference however, is that now they will live through them with the support that they deserve. As I have already shared in previous blogs, I keep finding myself wondering about that age-old question, “What is my purpose here on earth?” I still can’t explain to you why I was born in a world that is allowing me to earn a college education. I also can’t really explain to you what pulled me towards Uganda for an internship. I can tell you it wasn’t for an adventure, due to bravery, or for any form of recognition. It was just something my heart said I needed to do. Now that I am here, now that I have heard so many painful stories, now that I have seen some of the things I have seen…only now am I beginning to understand my purpose. Five weeks ago, I was preparing for a trip of a lifetime as a young college student, eager to see the wonders of Africa and learn about myself, Uganda, and my place in this world. Today, five weeks later, with many thanks to everyone who helped me get here [especially my Mom]; I am now the Director of a newly developed non-profit organization. With great pride and excitement, I introduce to the world the Future Diplomats Education Centre Foundation. Our first mission: Construct a dormitory for the children of Future Diplomats Education Centre. Currently, the school has about fifteen beds for children who either have been orphaned or live far from home. 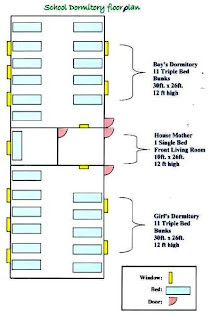 Six of those beds don’t have mattresses, so two beds sleep three students each. Fifteen beds doesn’t come close to meeting the high need for student housing. There were 100 students on my first day of work five weeks ago; nine students have registered since my arrival. The parents and caretakers of approximately 50 children consistently offer to pay in full for their child to live at the boarding school just to ensure they will remain at a safe and secure location. I want to bring a place of shelter and security for the many orphans who attend Future Diplomats Education Centre. This will also be a place where children who live far away can sleep so they are no longer in danger of abduction or getting hit by vehicles along the dangerous roads leading them home. Today’s blog is an introduction to my organization’s efforts to fundraise for this cause. I know many people in America and around the world wish they had the time, the know-how, or the means to help those in need. I want to make this as simple as possible for you! I have provided the venue, the reason, and the validation of trust and respect. The cause and need are present; the solution is clear. So many of you have given me support throughout the process of my travels, and you continue to support me as you stand alongside me throughout my journey here. I am asking you to please, spread your support by donating any amount of money to the Future Diplomats Education Centre Foundation. Whether you donate $1.00, $5.00, $50.00, or $500.00, please know that anything will help. 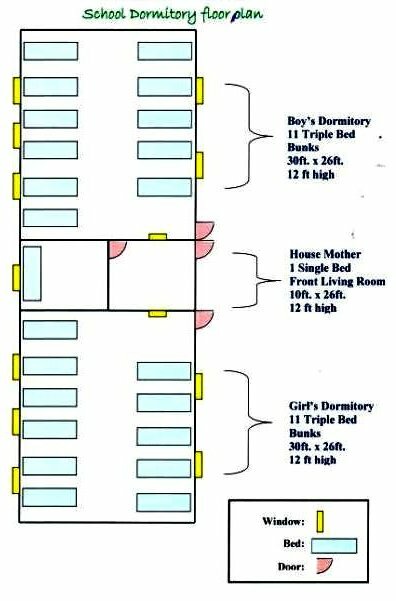 The dormitory, solar panels, and all furnishing will cost approximately $16,000 U.S. dollars and will house 33 girls, 33 boys, and a Matron to look over the children. The foundation was recently constructed using donations from the caring people at the WWU Foundation. You have read the stories of children who have been saved in many ways by the kindness of Volset and the Future Diplomats Education Centre. I will continue to share stories of these children in my blog. Together we have the power to save many children and leave a lasting impact on this community. Please email me at pettet.kristen@gmail.com for more information. For those of you who are interested in helping further, I can provide information about student-sponsorship as well. Sponsoring a child to live in a dormitory at the primary school would cost $400 the first year and $340 each subsequent year after. If you are ready to donate to the dormitory today, please click on the link below. You will first be asked to submit the desired donation amount. Then if you do not currently have a membership to PayPal, find the link that says “Don't have a PayPal account?” and follow the billing instructions. If you have a PayPal account, you can login and send your donation through the existing account. For more information about Future Diplomats Education Centre Foundation, click here.